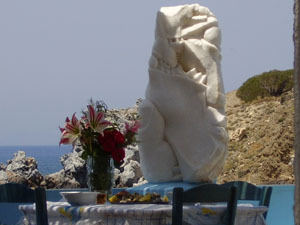 “Efthimios Restaurant” is right on the sea, all our dishes are accompanied with the wave’s aroma and the view of the ocean. We serve homemade traditional cuisine, fresh fish on the grill everyday, delicious salads and the best wine. Vegetables, fruits, raki, red and white wine are from our own production in Abram. In our restaurant you can taste all kinds of local products like meat, cheese and potatoes. Here you will also find soft drinks and ice creams for the hot days. Greek nights are organized with the sounds of bouzouki and guitar, plenty of wine or beers and dancing, a great chance to make new friends or have a great time with the ones you already have.